The school’s legacy is complex, and some students had bad experiences, others had positive ones, and many had both. Just as everyone’s experience was different, boarding schools were different. Sheldon Jackson was a private school and students had to pay to go there. Many were legacy students, whose parents and even grandparents went there. For students alive today, they were not forced to go to school, but they and their parents were forced to make a terrible choice – if they wanted education, they had to leave their homes, family, culture, community. There was deep damage done to generations, not only losing their culture, but in being told that it was not worth anything, losing their sense of themselves, their culture, parents, language, as worthy. There are also damaging consequences from taking away a person’s sense of power, through forced submission to rules and customs of an alien culture. Boarding schools were engaged in a culture-replacement project, based on the assumption that Native culture and language were not only inferior to Euro-American culture, but that they had to be stamped out in order for Native people to progress. The really important and difficult thing about mission education is that it was never simply missionaries forcing Natives to do something. Mission and government schools varied, through time, and for different students. On one end were children taken from their parents against their will. The vast majority, perhaps all Sheldon Jackson students in the 20th century were there because their parents wanted them to be there. Native people long ago, just as now, made their own decisions, and had their own reasons for adopting the dominant education and culture, or for making the sacrifice to send a child to Sheldon Jackson. This is hard to understand now, how Native people could have written and spoken about the need to “give up the old ways,” how Native people could have exhibited pride in assimilation. Many parents deliberately did not teach their children their language, in the belief that it would hold them back. This is what we have to try to understand – the atmosphere 50 years ago or more, when abandoning one’s language seemed like a good choice; when there were few or no other options. It was not so long ago that being Native was understood as a handicap. There was no sense of how important language is to culture, and how important language and culture, and pride in one’s heritage, are to a healthy sense of who we are. Racial bias was pervasive. The assault on traditional culture was coming from all sides, from the government and popular culture, not only in education. When we paint all missions as sites of forced assimilation we ignore the complexities of the past. Sheldon Jackson was successful only because Native parents supported it. In the earliest years, the mission tried to keep children by force, but in the 20th century it was unnecessary. We paint missionaries as villains, we drive a stake through their hearts, and think we are good. Demonizing missionaries only deflects attention from the continuity of past attitudes into the present. Racial bias, stereotypes of Native Americans, and patronizing attitudes did not vanish with the missionaries, even if we’d like to pretend they did. A few weeks ago I was telling another friend about an interview with an older Native man, who still believes that not teaching the children the language was a good decision. My friend gazed at me with sorrow – the kind of look I get from those who regret I don’t accept Jesus as my Savior – as if by listening, and acknowledging this man’s viewpoint, arrived at in the course of his traumatic early-life experience, I was in agreement with his position. The next day, I talked to a graduate of Sheldon Jackson High School in the 1960s, a woman who I knew as politically active, and I was expecting to hear about racist attitudes and harsh discipline. 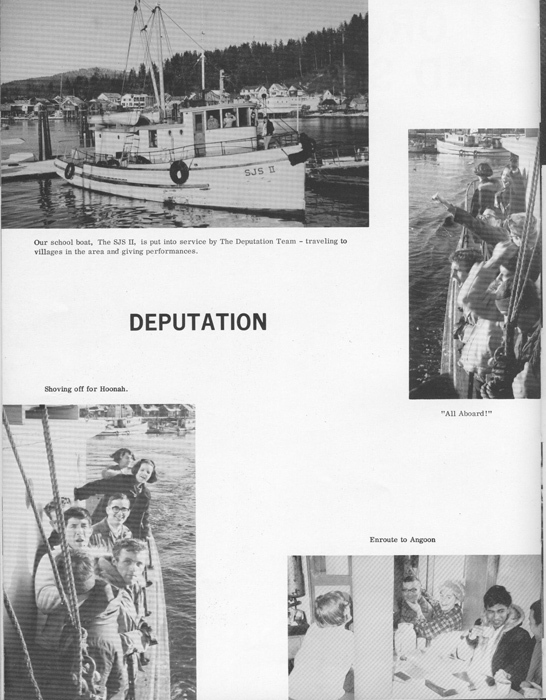 Instead, she told how she attended Sitka High School for a year, before going to Sheldon Jackson, and how there was a “world of difference” – that SJ was “like family.” How at Sitka High, she was a nobody, a “little Native girl.” Some other Native kids identified and were treated as white, and were popular at Sitka High; but for her, there was “so much racism.” At Sheldon Jackson, “life changed.” She was accepted as a Native student. Through her years at Sheldon Jackson, and through church, she has connections, everywhere in Alaska, even where she has no relatives, if there are SJ people from the years she was there. This was another surprise, but an unintended consequence of segregated education at Sheldon Jackson was – in spite of the suppression of Native language and culture – to foster the identity of this generation as Alaska Natives, across tribal and geographic lines. Later that same evening, I saw a film, Strangers No More, about a school for the children of immigrant workers in Tel Aviv, Israel. The film followed a handful of children, refugees who had seen family members murdered in front of them, who had grown up in refugee camps, and had fled to Israel. Again and again, tears came to my eyes, as the the women in the film, a teacher and the principal, took care to help the children through the traumas they had been through, and to help them to succeed in the school. The compassion and caring of these teachers was extraordinary, as was the deep gratitude and love of the students for the teachers, and the affectionate relationships among the children. The children’s faces glowed with love and pride. It was clear that without this school these children would have much diminished chances of success, perhaps even survival. One teacher says, it’s in the Bible – Jews have a duty to help those less fortunate. Here is a mission school. Were the Tel Aviv teachers sensitive to the cultures of the children? They taught in Hebrew. It’s like SJ in another way: the power relationship is unavoidably uneven. The helper has more power than the student – or even the adults, the parents of the children. They helped the father of one young boy – tired, fearful, weary – by helping him through the process of extending his work visa. This is a great good – but it also reinforces the power relationship, and his helplessness.What does that do to how the son sees himself and his father? Any time the more fortunate help the less, we may be taking away their sense of control, of identity, and reinforcing the very power structure that has led to their problems – the war and evil that’s driven the kids from their homes. When the dominant culture trains kids from others’, we are implicitly putting down their culture. And, making the children outsiders in their own culture. There are important differences, of course. The teachers at this school could not have taught in the children’s languages if they wanted to, so they had no choice but to teach in Hebrew. Unlike Sheldon Jackson, they did not punish children for speaking their own languages, and were not teaching in the children’s ancestral home place. But in important respects, this school is much the same. We don’t know whether it works for all children, but for some, just at Sheldon Jackson, it is life changing. The children leave better off than they were, with a stronger sense of themselves, friends with children from all over the world. We still believe in the power of education, and in helping others. Public education in America came out of this basically patronizing, missionary impulse to help less fortunate children, and still has this sense behind it, so we need to learn about these more explicitly mission schools. As we go forward we have to consider what it is that is, and was, beneficial in these schools, and whether we can minimize the bad. Or, can we imagine an entirely new model, that integrates, and is guided by, students’ culture and language? How much of the good is due to the individual teachers – like the best teachers at Sheldon Jackson, they genuinely respect the children and their abilities and expect the best from them. These teachers are highly educated themselves, and respect themselves. You can see that a poor teacher, or one with control issues, would be disastrous in this situation. How much of the success is the fact that for these children, there are no alternatives? So there is no way but up. There must always be this complexity. Perhaps the best thing is for us to be aware of it, and to try to be humble, and motivated by what’s best for the child – and try to be open to what that might be. A school can be all downside, discipline without love, politics or doctrine trumping making the child feel safe, appreciated and able to grow, reinforcing a child’s sense that he is a failure. It depends on the individuals, and the culture of the institution. When it works, it is because of a genuine human relationship, and the exact situation, the setting, the times; and it’s a subtle, individual thing. You can imagine one kid being ignored, not fitting in, and experiencing humiliation; while next to him, a kid whose temperament fits better with the teachers and the culture of the institution thrives. No doubt this school in Tel Aviv is not perfect, but it’s just as unlikely that Sheldon Jackson was wholly to be condemned. All offer important lessons.